Jinkies!! 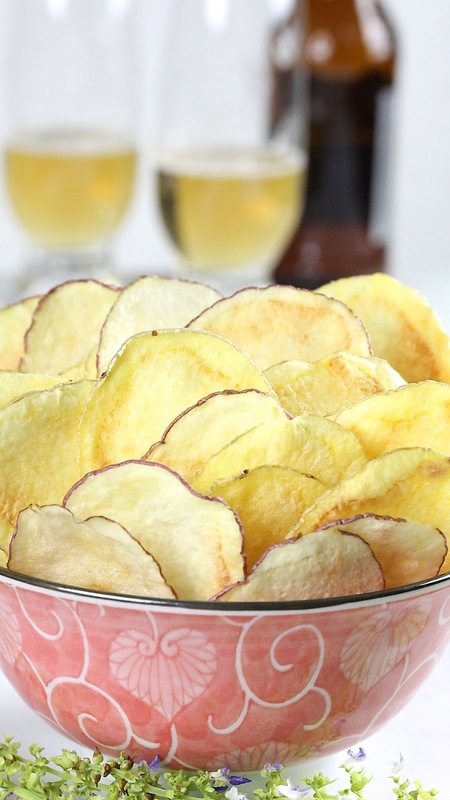 Did you know that perfectly crispy potato chips can be made in the microwave? Yes, they can! 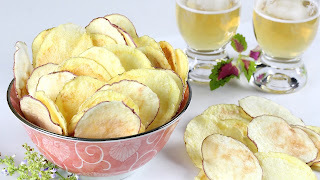 Delicious homemade chips without using a hot oven and without deep frying is possible. I had to try it myself, and now I'm a believer! Hi friends! For some reason I had the urge to channel Velma today. Did you ever watch Scooby-Doo? It's one of the great TV cartoon classics as far as I'm concerned. I used to watch the original series, Scooby-Doo, Where are You!, religiously as a child in the '70s. It ranks up there, next to The Flintstones (you have to love that loudmouth Fred). Okay, now hat I have dated myself and feeling quite old in the process, let's talk about food. That always makes me feel better! Microwave potato chips have been around a few years. I finally made my first batch last week, and I'm glad I did! It was a success. As a cook who likes to experiment, there are simply too many recipes to try and not enough time to do it. Well, I can cross cooking potato chips in the microwave off my list. Yay! There are benefits that come with making your own potato chips, one of which is you get to control exactly what goes into it. 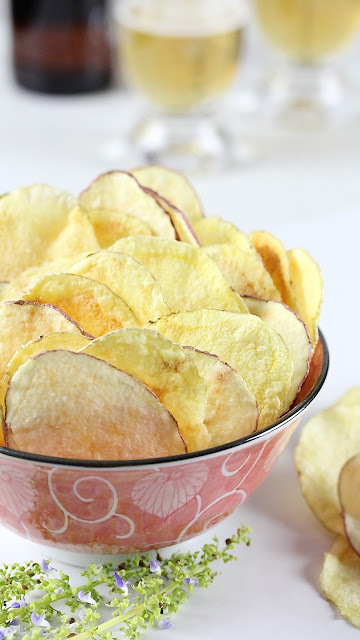 Unlike many store bought chips, there are only three ingredients involved: potato, oil, and salt. That's it! And no preservatives! You have complete control—from the kind of oil to the amount of salt. In fact, you can omit oil altogether for really light and healthy snacking. As for me, I'm an olive oil kind of girl. One other benefit is that you determine the quantity of chips to make—SOOOOO important! If you're like me, and I'm thinking many of you are, the amount I eat is directly proportional to the amount available. Am I right? Having a huge bag of chips in the house is a very dangerous thing for a girl's (and guy's) waistline. Out of site is NOT out of mind. If it's in the pantry, I will hunt it down! So, when I make only what I need at the moment, the problem is eliminated! As it turns out, microwave potato chips is perfect for smaller batches. It is super easy to make and easy to cleanup with no greasy mess. But since you can only cook a small amount of chips at a time, with each batch requiring 5 to 6 minutes to microwave, large batches are best left to deep frying or baking. If you have not tried to microwave potato chips, just do it at least once. It is fun and fun to eat! Hope to see you next time. Take care! Peeling potato is optional. I think it looks prettier with the skin on. 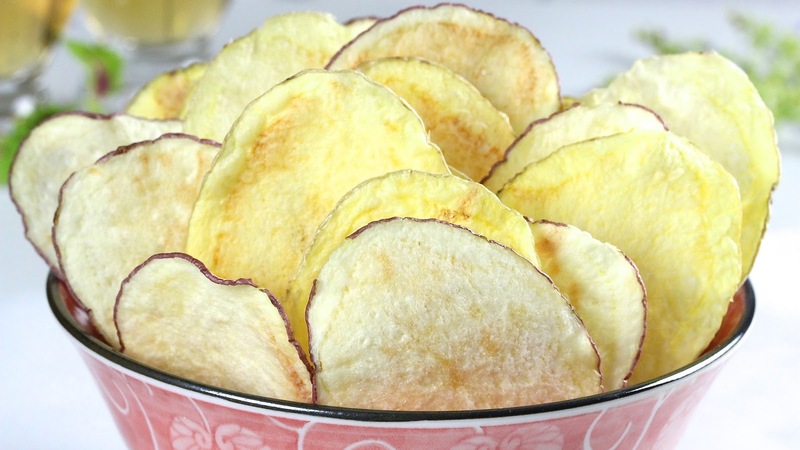 Potato slices can be cooked on top of a paper towel lined plate or a greased plate. I prefer paper towels, because the potatoes tend to slide around on greased plate. Use sea salt sparingly at first. Taste test the first batch and adjust salt to your preference on the next batch. If the chips lose their crispness during storage, microwave15-20 seconds (and allowing to cool 1 minute) to restore crispness. To customize flavor, sprinkle potato slices with seasoning of choice after they are brushed with oil. Wash and dry potato. Peel skin, if desired. Using a mandoline or a sharp knife, cut into 1/8" to 1/16" inch slices. Rinse the slices under cold water until the water runs clear to remove excess starch. Or soak in a bowl with plenty of water for 15 minutes, then drain and rinse. Line a microwave oven proof plate with a few layers of paper towels. Remove a small handful of potato slice from the bowl. Pat dry on a clean kitchen towel. Brush the top with olive oil. Sprinkle with salt. Flip over. Oil and salt the second side. Arrange slices in a single layer on the plate and without touching each other. Microwave at full power for 3 minutes. Potato slices will begin to brown slightly. Turn slices over. Microwave an additional 1-2 minutes at full power or 2-3 minutes at 50% power. The edges will curl. Remove chips that crisp and turn light brown early. Continue cooking the remainder until they are done. Place chips on paper towel line surface to cool. Repeat cooking the remaining potato slices. Store in an airtight container. 1) Cooking time may vary depending on the thickness of your potato slices and the strength of your microwave. Keep on eye on the slices while they cook as cooking time may be faster or slower than the suggested timeframe. Adjust cooking time accordingly, if needed. 2) Omit oil for a healthier option. I totally had to do a double take... chips in the microwave?! Brilliant! I've never tried that before because I had no clue it was doable. Can't wait to try this, Thao! Cheers! I had no idea microwave potato chips are a thing! And I kind of wish I still didn't :). I have a feeling I'll be making pounds of these babies this weekend. Potato chips are one of my favorite things EVER! Have a great weekend, Thao! LOL!!! I like potato chips, but you my friend, you are in it deep! 😀 Utz and Wachusett are my two favorite brands, but I have never seen or had crab chips. They sound good! I'm going to check out the chip aisle more closely on shopping day. And, oh my gosh! I forgot all about Captain Caveman! He was a character. Happy weekend and happy snacking, Karrie! Made these once before but not with the oil. Must try this version because the others were not good. I adore potato chips! You know, I've been making my own chips for ages (because portion control!) but I never knew you could make them in the microwave! I'm so excited!! It is pretty cool, Kate! I can't wait to make it for some of my friends. We make microwave potato chips often. We HAD this nifty little holder that you could put each potato slice in, microwave and end up with yummy, crispy, crunchy chips. I'm sorry that your potato holder got ruined! I know how it feels when a favorite gadget is destroyed or no longer works. There is actually a mourning period... :( I hope you find a replacement for it so that you can make more yummy chips! I didn't know that microwave potato chips was a thing! I need to try asap. Salty, crispy chips are one of my favourite snacks.